One of my clients is a new media start up. Their mission is to create high quality media about African communities, and distribute it via the internet to people (African and nonAfrican) who want to know what is going on, at a grassroots level, in the developing nations. Brilliant! I’m in. But what am I in for? So one day we hit a wall. We were trying to talk about campaign plans when all of a sudden my client confessed that he couldn’t focus because his mind was swimming with unanswered questions about the basic structure of his company. Now, I’m not really a, there-there-sort of girl. If challenge is in the air, I’m genetically predisposed to work on a solution. So I got out my note pad and said, “Draw it.” The first tool I pull out of my problem-solving kit is the mind map. Whether I’m piecing together a tricky argument for a proposal, condensing research and interviews into articles, or strategizing a campaign, I use mind maps to quickly capture the essential ideas, and connect the dots on the fly. Mind maps help me break through writer’s block, uncover unimagined angles, focus my efforts, and I even use them to flush out my business objectives. When I showed my client the technique I use, we were able to very quickly map the bare bones internal structure of his company. From there he quickly mapped the department priorities and the communication flow – all the things that were swimming in his mind. With all that down on paper, he had something he could look at and play with visually until it made sense. And we could get back to the meeting! Since he found the process so useful, we started a mind map for the campaign. We identified who is currently in the company’s social network, who they are working to partner with, who they are making media for and about, who has a confirmed interest, and we started connecting the dots. Why mind maps are such a powerful business tool: When the essence of an idea is captured on paper, and made visual, the analytic left brain is able to rest, and the creative right brain is able to visualize previously unseen connections and possibilities. And then, when the right brain takes a rest, the left brain can see what’s been going on, and plot next steps. As a business person, it is both fruitful, and fundamental and can be used for everything from long-term planning to operations management. And simply as a human on the planet, it is empowering. I did an experiment and started using mind maps to journal my day. Doing mind maps at night was a fun way to capture my day, and after doing a few I was able to flip through them and see some really interesting patterns, patterns I’m not sure I would have noticed in a written diary. we are building a fabulous audience for fantastically important media about Africa. To see some examples of mind maps, here are two to compare. 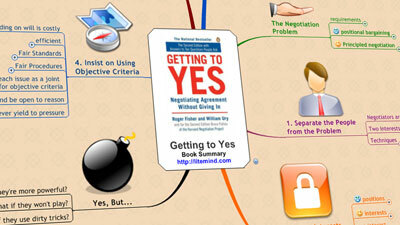 The one pictured here was created with Freemind the free software I use, click here to see the original mind map overview of the book Getting to Yes: Negotiating Agreement Without Giving In by Roger Fisher, William Ury and Bruce Patton. The map was published on Litemind. This one about social media is visually less vibrant but very useful.Click on the nodes to see the layers. You can use mind maps differently for different goals. You might find that one type of map works for you, but doesn’t communicate anything to anyone else. The one here is great for giving people an engaging quick reference but creating and placing the graphics would slow the process if you are just trying to get ideas down quickly. A pen and paper is as good as any software, if not better, so don’t get hung up on how you map – just try it. Do you use Mind Maps? Post a comment and share how they help you in your work. For a step by step guide to mind mapping read this article on Litemind. Great article Kim about a good approach. you might be interested in meeting mind mapper Avril Orloff who uses this technique in meeting facilitation. I use MindApp (http://www.mindapp.com) to help me write articles and create communications plans. I use Personal Brain (http://www.thebrain.com)for organizing my thoughts on my computer and laptop. And of course, paper and post-it notes work very well too. Great article ! Thank You !